First of all, I should mention that these Jots are not only my 500-words a day challenge, but also part of my Ultimate Blogging Challenge challenge (http://ultimateblogchallenge.com). This will really be a stream of consciousness piece. Boisterous I am not. Nor is Kevin, nor are the kitties. Well, not normally. Elliot does have moments of boisterousness, for example when he runs around or meows plaintively for no apparent reason. We live in a non-boisterous neighbourhood – non-boisterous, except for the neighbour who, on New Year’s Eve, was walking up and down the street banging on a pot. At least it was at midnight, so we were pretty sure of the cause for said boisterousity. Sometimes our other neighbours get boisterous when they throw a party. We’re never invited to join them in their boisterousing, but it doesn’t ever disturb us. Work is never boisterous. Our offices are in a library, so boisteroustance is discouraged. When you work in an open office (well MY desk is in the open – others have doors to close, but let’s not pick that scab…) it doesn’t take much boisterousation to get on my nerves. Especially if I am trying to attend a meeting on my computer or talk on the phone. Whoever thought open offices were a good idea never had to actually work in one all the time! Oh, and I almost forgot the construction going on next door which, at times, borders on boisterous – more annoying for the folks who work (and teach, or try to) in that building. It was certainly not boisterous today. Students aren’t back yet, and everyone in the office was very quietly catching up after a week (or in my case, two weeks) off from work. Have I ever mentioned how much I love working for a post-secondary institution, especially at Christmas time? Our city does not generally indulge in boisterous behavior. Except downtown during tourist season. Kevin loves the crowds and their boisterous nature, while I prefer a more non-boisterous atmosphere. Sometimes the seagulls can get a bit boisterous, screaming as they fly overhead in search of dinner. And every so often the boisterous cries of the peacocks in the park cut through an otherwise unboisterous evening. The weather here can also get boisterous, the winds wailing through the trees setting our little windchimes a tinkling. We wonder sometimes if they bother our neighbours, and then promptly forget about them when the wind dies down. Tonight, my life of unboisterous continues as I do some yoga, write 500 words for my blog post (phew!) and take some pictures for my various photography challenges. The most boisterous thing happening tonight is a curry and smoked paprika chickpea, potato, and kale stew which is currently simmering on the stove. Kevin will likely boisterously suggest, when he gets home, that the only thing that will make my vegetarian stew better is…wait for it…meat. Probably the main reason I will never become a vegetarian (aside from, well, bacon). Well, this piece is definitely confirming for me how hard it is for me to write 500 words about boisterous. Let’s hope tomorrow is easier, and less boring for you! 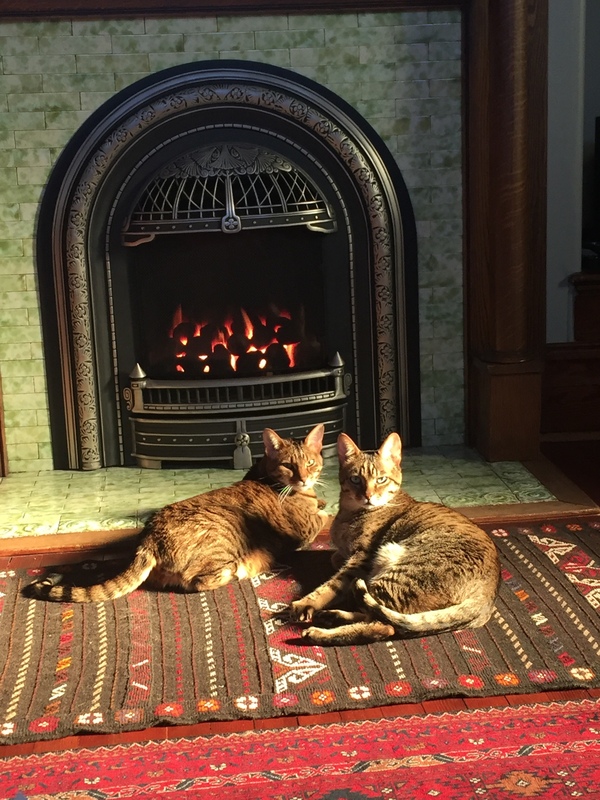 And to conclude, our boisterous kittens…because we can never have enough kittens. 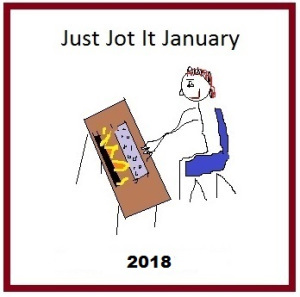 Posted on January 2, 2018, in Writing and tagged JusJoJan. Bookmark the permalink. 17 Comments. If those kitties are being boisterous, then I must be Wonder Woman. Open office concept? I agree with you … worst idea of the 20th century. I nearly quit a job over it, back in the day, and finally got my way. The biggest detriment to concentration and thought processes ever to hit the market, but it is supposed to promote “teamwork” and cohesion. Yeah, right, feed me another another magic cookie. Well, it sure hasn’t helped the “team” part of our office! It rarely does, but some psychologist came up with the ‘brilliant’ idea based on ‘research’ into the behaviour of humans, and companies have been buying into it ever since. Yeah, I got a little carried away, but it was fun-istious! I’m unaccustomed to all these Emily words! LOL It’s a very boisterous post! I think I can safely say that I get a tad bit envious of how much more boisterous bumps on logs are than I am. I’m an introvert, and a stoic. I don’t do boisterous very well at all. I am especially unboisterous first thing in the morning…which is right now…where’s my coffee?? ?